In addition to being able to view individual member check-ins on the member’s account view you can also view the total number of member visits (check-ins) for the month or even for an arbitrary date range. The number of member visits you’re getting each month at your club is an extremely important metric and the basis for many other valuable club metrics. For example, Lifetime Athletic uses the number of daily member check-ins for a metric called Unit Cost Ratio which is simply the total daily labor cost in any department divided by the number of daily check-ins (for front desk staff with a daily labor cost of $800 and 2,500 check-ins you would get $800 / 2500 = 0.32 dollars / visit). Astute club owners and managers will watch these ratios carefully. Your monthly check-ins are part of the Location Performance report that you can receive every day automatically in your email. Additionally, you can run the Location Performance report at any time from the reports menu. 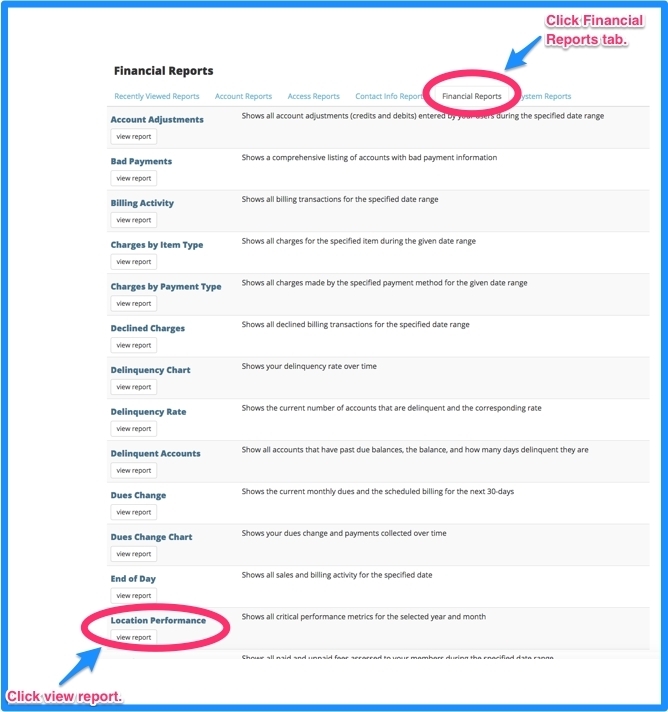 Click the home button and select reports. 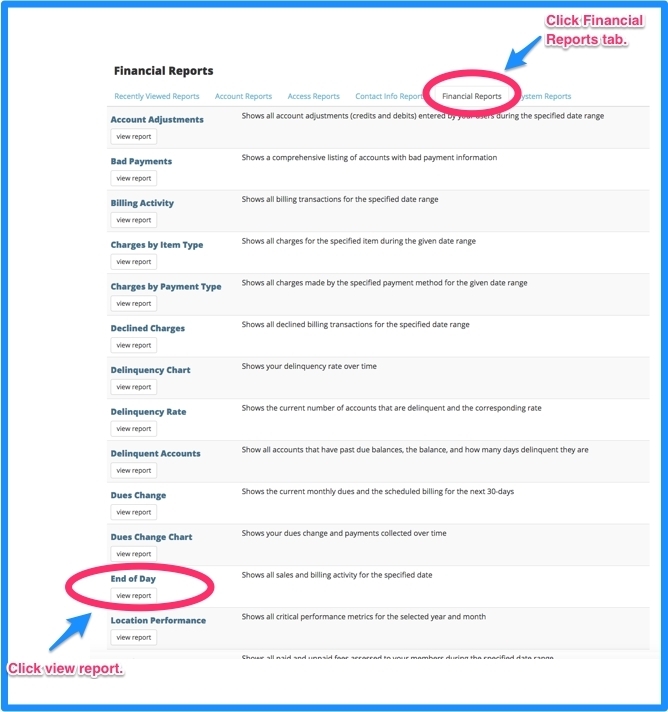 Click on the Financial Reports tab. The reports are listed in alphabetical order, you will have to scroll down to Location Performance. Click on view report. This will show you all the check-in totals for your gym! 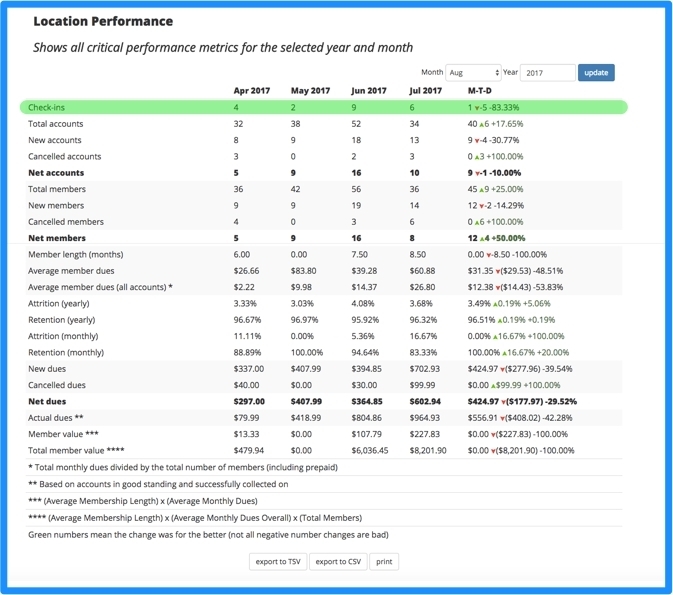 The total monthly check-ins are the very first line in your Location Performance report because the number is that important. If you’re looking for one metric that all of your staff can wrap their heads around it’s the total number of daily and monthly check-ins. You’ll also notice that your daily check-in total is displayed on your End of Day report which can also be access in the Financial Reports tab. Like the Location Performance report, the total number of daily customer visits (check-ins) shows up right at the top of your End of Day report. Finally, we’ve recently added a new report that lets you specify an arbitrary date range and get the total number of member visits during that date range. Start by running the Check-Ins report by click on the Access Reports tab. And then enter the date range that you would like to get the total number of member visits for and click the update button. If you make the total number of member visits a number that your whole team focuses on you will see dramatic improvements in all of your income sources (membership dues, personal training, tanning, and even retail sales) because more visits equal more opportunities for your team to sell products and services. Finally, the best possible indicator of a long term membership is that the member is using their membership. By keeping your members interested and coming to your club all of your key financial metrics will improve. What’s good for your members is good for you as a business owner!